My sweet tooth means that I do like dessert after dinner, even if it is just a yoghurt. Of course if my yoghurt happens to have a chocolatey twist, so be it. I spotted this Twix dessert in the new section on the Ocado website, and added it to my basket. 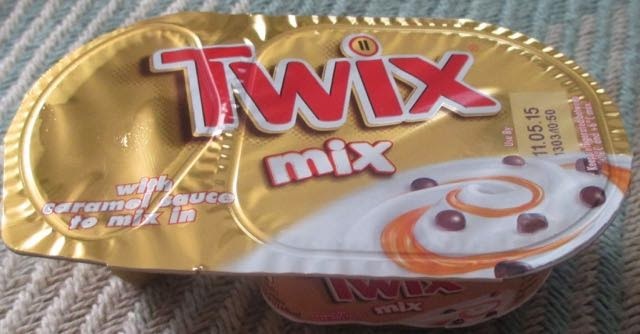 It is a yoghurt based dessert, but with a Twix theme, so I wasn’t expecting a rich chocolatey sauce inside the pack. The packaging mentioned that there was however caramel sauce to mix in, but I couldn’t quite picture how that would work. The dessert is in a split pot format too, I assumed the pot to mix in would be liquid based with chocolate and biscuit bits? It sounded a bit messy. Once I peeled the lid off I spotted this was incorrect. That particular section just contained chocolate coated biscuit bits, which left the question as to where was the caramel was. 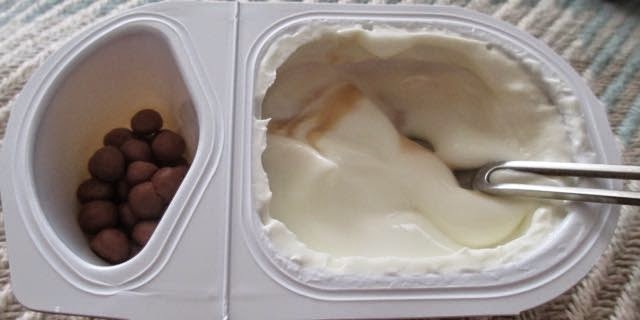 The yoghurt part looked plain white. I gave a little stir and realised that he yoghurt was sitting on a layer of caramel and that this was to be mixed in, which I did, but lightly. I also added the chocolate biscuit bits from the twin pot part. The dessert had a nice mix of textures, and certainly had a good hint of Twix about it, but it did stay firmly on the side of yoghurt with that being the main flavour. I liked the added chocolate and soft crunch from the biscuit, and the caramel added a nice sweetness to the over all flavour. It isn’t quite a healthy yoghurt, but it isn’t as rich as some of the purely chocolate based desserts I’ve had in the past, so I think it had a nice balance and I’m looking forward to trying the Mars Mix variety also released.